A first encounter with the baldfaced hornet can be memorable. I recall discovering a hornet’s nest about the size of a basketball when I was eleven years old and wondering what would happen if I pitched a rock into the nest. From a distance of about 20 feet, I hit the target squarely. I was immediately greeted by an angry hornet that made a beeline directly from the nest to a spot on my forehead between my eyes where it delivered a wicked sting. It was the kind of “kill shot” that snipers make in movies. I didn’t go down, but I did high tail it out of range and I never again tempted a hornet’s wrath in this way. 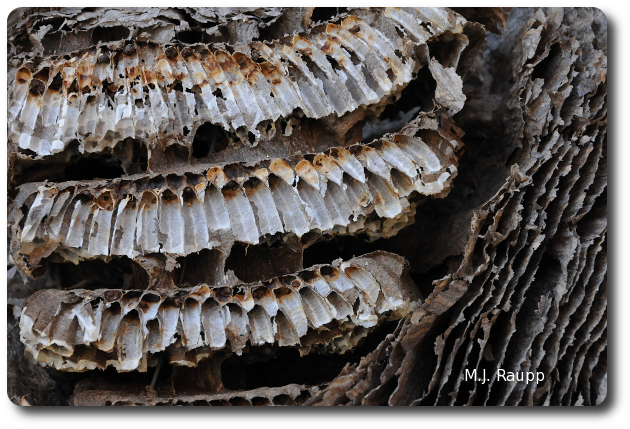 Elongate brood cells are enclosed by layers of paper covering the nest. The nest of the baldfaced hornet is a marvel of engineering. In spring, a queen that survives the rigors of winter selects a location to build the nest. Usually the limb of a tree or shrub will do, but I have seen nests beneath overhangs of sheds and houses. The queen gathers wood and plant fibers, chews them into a papery pulp and builds a few brood chambers into which she places eggs. She then constructs thin papery envelopes to enclose the brood cells that are home to her daughters. Larvae that hatch from the eggs are fed macerated caterpillars, flies, moths, and other insects captured by the queen. These larvae soon develop into workers that assist the queen in gathering food, enlarging the nest, and tending to the needs of their sisters and the queen. As the colony grows, the mother queen spends less time out foraging and more time at home laying eggs. Her daughters shoulder the load of finding dinner for their sisters and mom. The rapidly growing nest is in a constant state of transition. Portions of the exterior papery envelope are removed to accommodate an ever expanding number of brood cells. By late summer the colony will be in high gear, with hundreds of workers capturing prey and raising young and the queen busily laying eggs. The nest can reach the size of a small beach ball. As autumn approaches, workers build over-sized brood cells into which the queen deposits egg destined to become new queens and males. The mother queen dies and the virgin queens fly away and mate before seeking hibernal shelter in protected locations under bark, inside fallen logs, or in other protected locations. A worker adds paper to the outside of the nest. 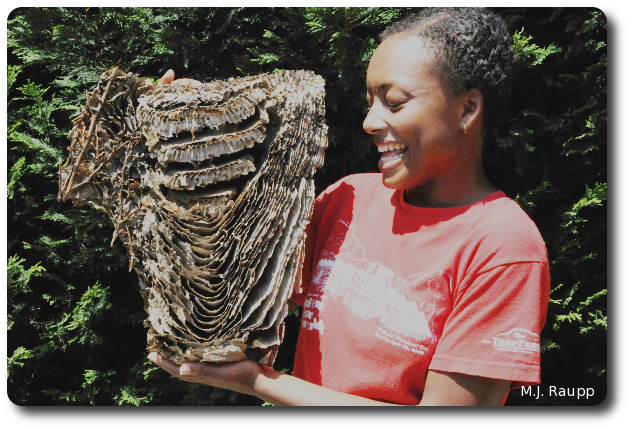 There is a common misconception that the large paper nest will house hornets for multiple seasons. This is not the case. Before winter, the nest is vacated by workers, queens, and males and it will not be used again in subsequent years. If you come across a large paper wasp nest, please resist any urges to investigate the nest too closely or hurl stones at it. The sting of a baldfaced hornet really packs a wallop and some people are allergic to the venom in the sting. If the nest is out of the way and does not endanger people, perhaps it can be left alone as these hornets consume large numbers of pests of our plants. If the nest is located in a place frequented by people or pets, then removal may be necessary. Professional exterminators can do the job. People allergic to stings of wasps, hornets, or bees should not undertake this task as baldfaced hornets are quite aggressive. Potent wasp and hornet sprays are available for home use, but if you choose this option be sure to carefully read and follow directions on the label.